I let Kate sleep until 11:30 yesterday morning. I wouldn’t have gotten her up then, but we had an appointment at 1:30. Here are her first words as she got out of bed. We were a little pushed for time, so I decided not to go our regular place for lunch and just get a sandwich at Panera. I didn’t tell Kate where we were going but was surprised that she asked what we were going to eat. I don’t recall her ever asking that before we have even left the house. I told her a couple of the sandwiches she usually gets. Several times before we got there (a 4-minute drive including a stop at a traffic light), she asked again what we were going to eat and if I thought she would like it. When we arrived, she looked up at the building and said, “What’s that?” After seating her at a table and setting up her iPad, I brought her a muffin. She got started on that while I waited for the meal to be ready. When I brought her lunch, she had one tray with the muffin to her right. I put the tray with her food on her left. After she had eaten half of her sandwich, she went back to her muffin. In a few minutes, she pointed to her sandwich and apple and said, “Is this ours?” I told her it was. She took a bite or two and then another couple of bites of her muffin. Then she looked at the plate with her sandwich and again asked if it were ours. Once again, I told her it was. She finished her muffin and asked one more time about her sandwich before eating the rest of it. We went straight to Barnes & Noble from lunch and arrived a few minutes before the man we were meeting. I was in line to get a cup of coffee when he arrived. I hadn’t met him before. He works for the development office at the University of Wisconsin. Kate was sitting at a table working on her iPad. I introduced him to her. Then we had a good conversation. I started by asking him if he had been a student at UW. It turned out that he had not and had only worked for the university six or seven years. That led to a conversation about his past experience and happenings on the campus. That was mixed with my telling him about our own experiences there and what I had done since leaving Madison. This was one of those times when I thought about the little cards I carry that say, “My wife has Alzheimer’s . . .” I slipped it to him after several of her questions. I am sure that helped him understand when she asked other questions. I’m realizing the value of having them with me. We came back home after lunch. Kate started working on her iPad but soon put it down and rested for over two hours. When I told her we would soon leave for dinner, she sat up and said, “Who are you?” I gave her my name. She asked her own name. Then she wanted to know my relationship to her. As usual, she was surprised, but this was different. She was very firm in expressing that this couldn’t be. I asked if she would like to see our wedding pictures. She did, and I picked up “The Big Sister” album her brother Ken had made for her last spring. I sat beside her on the sofa and flipped over to the section that had some of our wedding pictures. At first, she had trouble recognizing everyone. After I identified the people, she began to recognize them in other photos though she was far from perfect. She did, however, become quite engaged with all the pictures. Her skepticism about my being her husband was completely over. As we pulled out of the garage on the way to dinner, she asked my name and her name again. On the way, she asked where we were a couple of times. When we arrived at the restaurant, she asked its name. I told her it was the Bonefish Grill. Once inside, the hostess walked us to a table in the very back of the dining room. I followed the hostess but not too closely. Kate walks very slowly, and I didn’t want to get too far ahead of her. 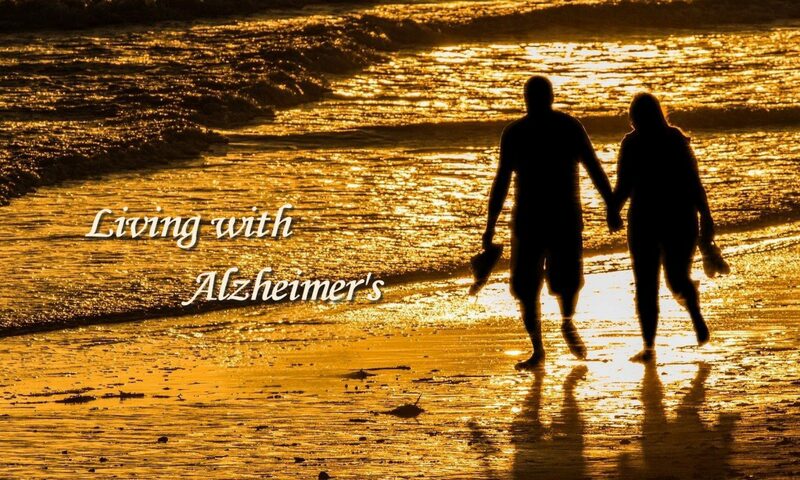 As the hostess and I stood at the table waiting for her, I said, “Have I told you that my wife has Alzheimer’s?” She said I hadn’t. When Kate approached the table, she looked at the hostess and said, “What’s the name of this place?” Kate didn’t understand her. Both the hostess and I repeated the name and looked for a sign on the wall, but there wasn’t one. I should add that we eat at Bonefish every Tuesday night and know the hostess. I am glad I had mentioned Kate’s Alzheimer’s. Once the hostess left, Kate heard the toddler behind us making some happy noises. She turned around and asked her how old she was. The mother, who was holding the child, said she was three. Then Kate asked the mother, “How old are you?” The mother was taken aback and said, “Thirty-seven.” Kate said, “You’re young to somebody like me.” The woman and her daughter were seated with a group of five other women who would have been about the age of the woman’s mother. A few minutes later, I pulled out another one of my cards, walked over to the woman and gave it to her. As I sat down, she looked at me and smiled. Then she passed the card around to the others at her table. When our server came to the table for our drink order, Kate said, “What’s the name of this place?” The server, whom we also know, looked surprised. I got another card out of my pocket and slipped it to her. Periodically throughout our dinner, Kate talked about the attractiveness of the restaurant. For her, it was just like the first time she had ever been there. I wish I could know how you as a reader are responding to what I have written. This was clearly a day when Kate’s memory was at its worst. It is a definite sign of further decline. From my perspective, however, it was a good day. Kate was happy. She was talkative. She was inquisitive. We enjoyed our time together. It saddens me to see her so lost in this world, but that burden is eased when I know that she is happy. There is nothing I can do to change the symptoms that accompany Alzheimer’s. I can, however, see that her quality of life is the best it can be under the circumstances. Days like this reinforce my commitment to do just that. Thank you, Marianne. You are a source of encouragement for me.